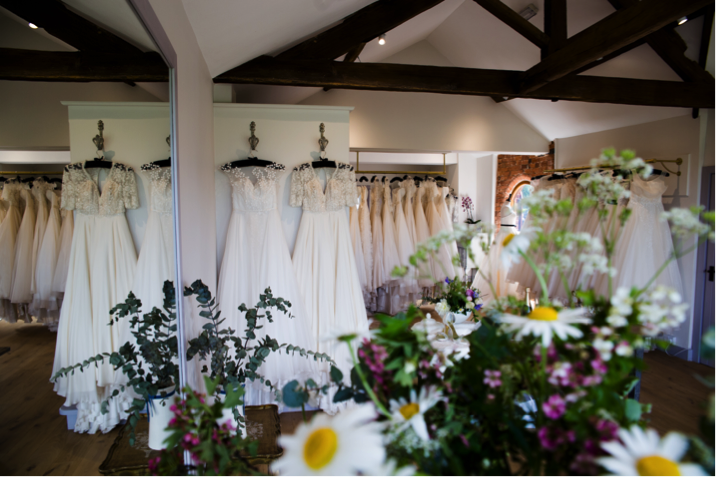 The flagship bridal boutique is situated in the heart of the Staffordshire countryside on the Duchy of Lancaster Estate. Surrounded by open fields and clusters of woodland, the boutique offers a calm and inspiring place for brides to begin their journey with us. Adorned with elegant furniture and fresh seasonal flowers it’s easy to lose yourself in the relaxed open plan showroom. A space that showcases the label and reflects everything about the brand’s aesthetic; quintessential elegance, timeless design and romance. Here at Lyn Ashworth England we understand how exciting and yet daunting it can be, when it comes to finding your wedding gown. Photographs and website images can only provide so much information, we believe that the process of selecting your perfect dress is a sensory experience; as much an emotional judgment as it is visual. You need to feel the textures and absorb the colours, let your imagination wander, re-affirm your instincts or be open to surprising alternatives. 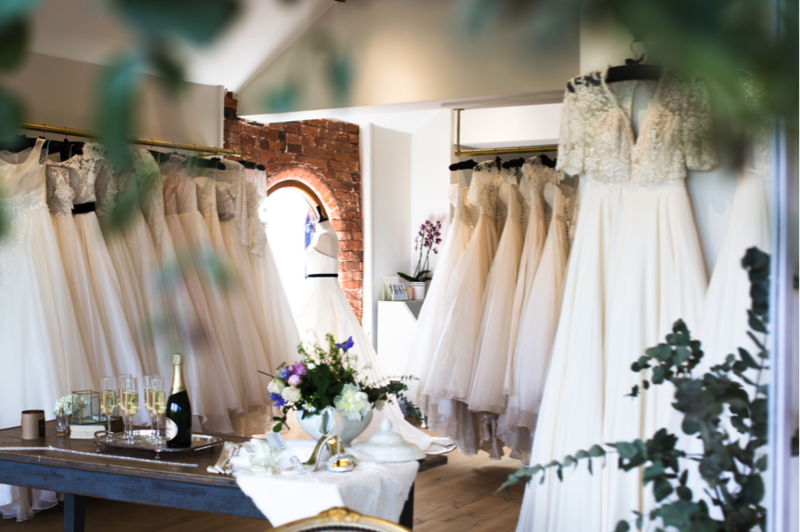 The showroom gives brides the opportunity to choose and try on dresses from across all of the Lyn Ashworth collections. 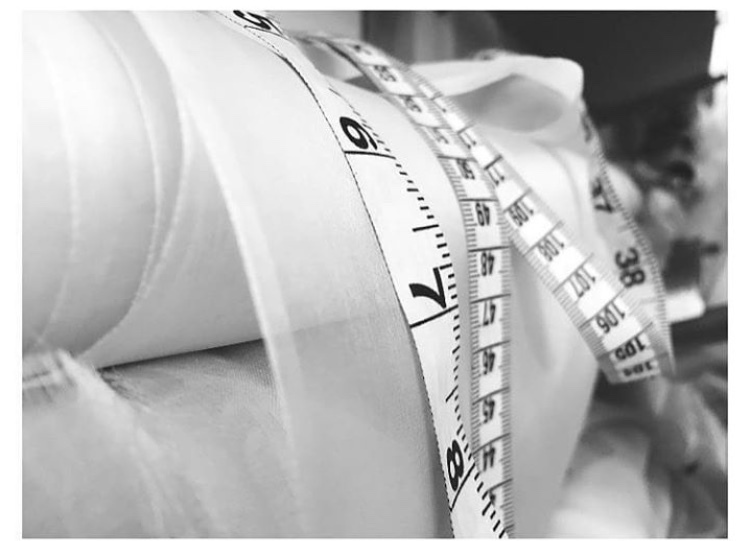 Over the years we have worked closely with brides of all different body shapes, upholding the ethos that the foundation of a quality garment is based on the key elements of fit and proportion, not size. Working closely with our brides to design and create a wedding dress that perfectly reflects their personality. Based at Upper Linbrook Farm, Kingstanding, Staffordshire, the design studio is where the process begins. All gowns are designed by Sarah and then handcrafted by herself and her highly experienced team of pattern cutters and seamstresses. 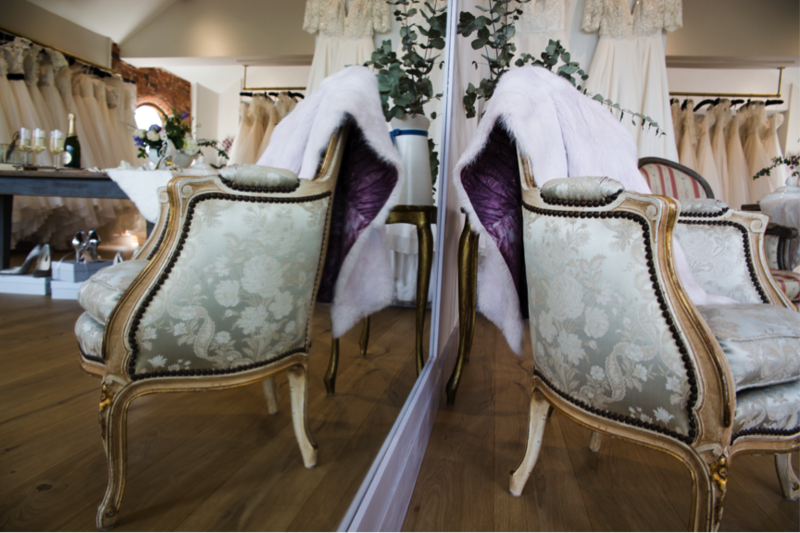 Each bridal appointment starts in the showroom boutique adjacent to the studio; with a one to one either with Sarah or one of the Lyn Ashworth team. Over a cup of tea, a glass of bubbles or even a sneaky gin cocktail, we’ll take the time to get to know you. You may already have a defined idea of your dream wedding dress or you may be daunted by the thought of the whole process, even slightly overwhelmed. A mixture of anticipation and excitement is to be expected but don’t forget this is such an exciting time in your life, choosing your dress should be a memorable experience full of laughter and happy memories. Appointments are never hurried; we take the time to talk you through our different style options, fabrics, colours and trimmings. Exploring the possibilities of changing or mixing styles to reflect your personality and body shape. The joy of this process it that no bride is the same, allowing for new and exciting ideas to develop as we explore the many options with you. Lyn Ashworth is renowned for its signature corsetry. Created and designed to enhance the bride’s body shape; the internal corset gives foundation and support, an essential feature for many of the designs. For those brides searching for a more relaxed look, softer silhouettes can also be found within the varied collections. Whatever the style all dresses are constructed, to exacting standards, with the most luxurious fabrics; finished with the option of matching handmade accessories such as veils, jackets and belts. With the design studio situated adjacent to the boutique showroom, Sarah and her team are at hand to offer advice and guidance, from your first consultation through to your final appointment. A chance to choose different elements and mix styles and shapes from the showroom collections. From simply changing skirt shapes and necklines, to altering overlay silhouettes, fabrics and embellishment changes. Priced on an individual basis according to requirements. The bride and designer work closely to co-create a personal vision. Brides can personalise every element of their gown and once the design is chosen then the couture dress making service begins. 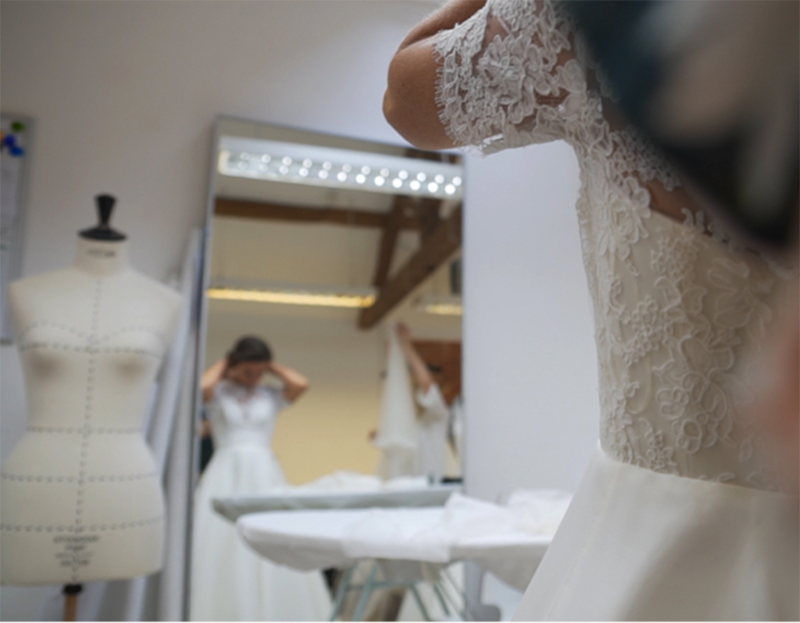 From the first consultation the bride will see her beautiful dress develop through to the final stages of collection. Once the design has been finalised, one to one fittings will take place in the boutique with the in-house atelier team or within the design studio by creative director Sarah Barrett. The perfect fit is paramount to every dress we create. 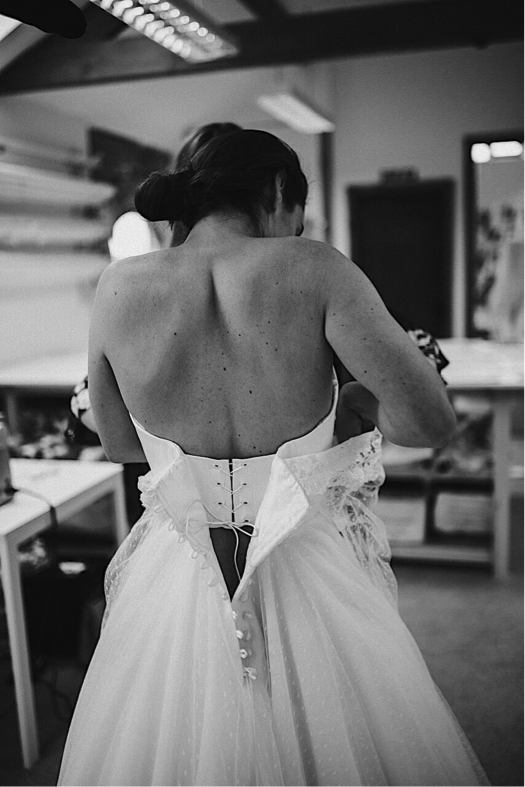 The highly skilled and experienced in-house seamstresses work their magic throughout the process to ensure your gown fits you to perfection. 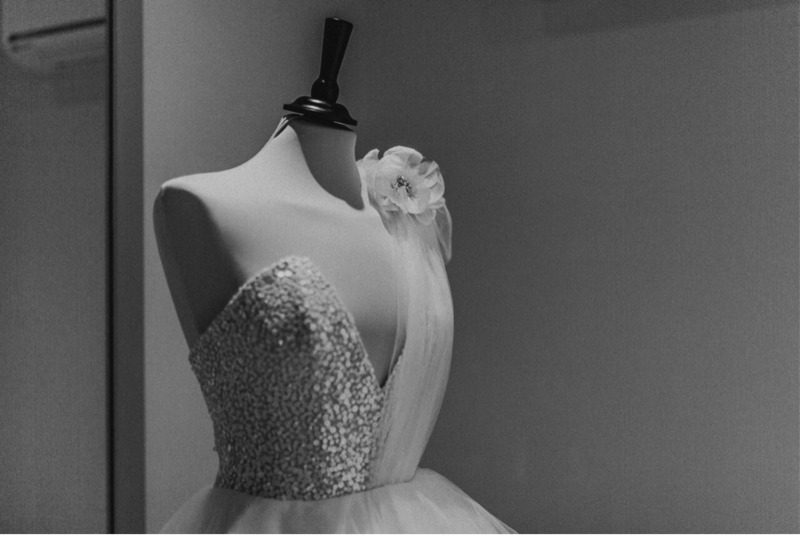 Your dress fittings will start approximately 3 to 4 months prior to your wedding date, depending upon which service you choose. You will look to collect your wedding gown around 2 to 3 weeks prior to your wedding date again depending upon which service you select. The Lyn Ashworth team will be with you every step of the way and at hand with any last minute requirements. All alterations are a separate cost from the purchase of a standard size. To allow all our brides the experience we believe they deserve. The Lyn Ashworth England Collections start at £1,700 we offer a made to measure collection from £2,200 and bespoke gowns from £4,500. 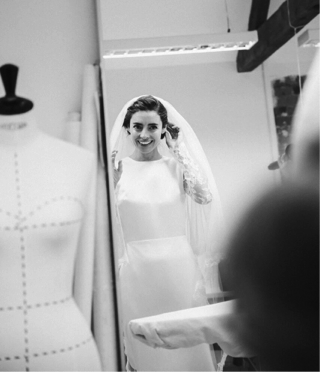 A bespoke dress involves the process of working with Sarah for all design and fitting appointments. Each element of the dress is created exclusively for you, from fabrics and embellishments to perfect tailoring. If your budget is somewhat lower than the starting price of our dresses, we do offer the ability to purchase from an exclusive collection of ex showroom display dresses. For further details please contact the showroom boutique. We offer a by appointment only service from our showroom boutique, this gives you the opportunity to view and try on from all our collections. To make sure you have a relaxing and rewarding experience we would advise that no more than two or three people accompany you on your first appointment, this way we can ensure the focus of the session is on you. In our experience too many opinions can make the first appointment unintentionally confusing. You are more than welcome to bring other members of your bridal party at a later stage.